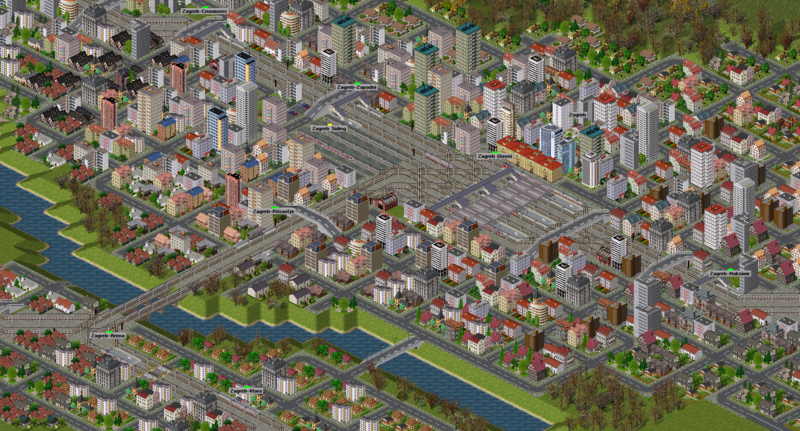 Érd is a small-ish city on the south-eastern corner of Budapest, and on my network it's an important railway junction. 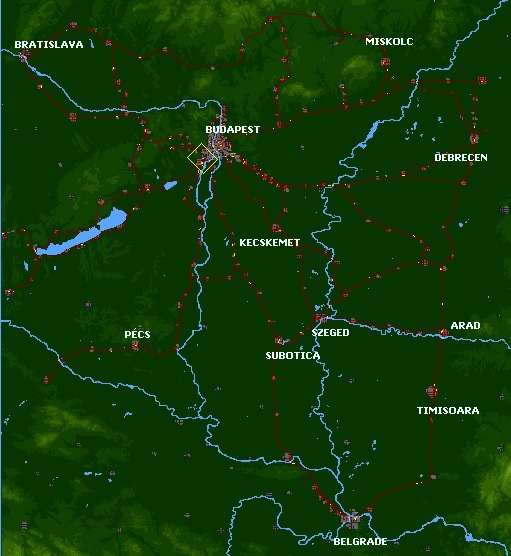 Express trains from Budapest to western and southern Hungary stop here, and connect with local lines -- including a cross-city line via Budaörs (in the top-right of the picture). From there, one can travel on express trains to north-western Hungary and Bratislava. I'm using pak64.German as a basis, but I'm making most of the trains from scratch based on traction used in the region (exception: I'm using one of Emil Sawicki's Hungarian locomotives.) 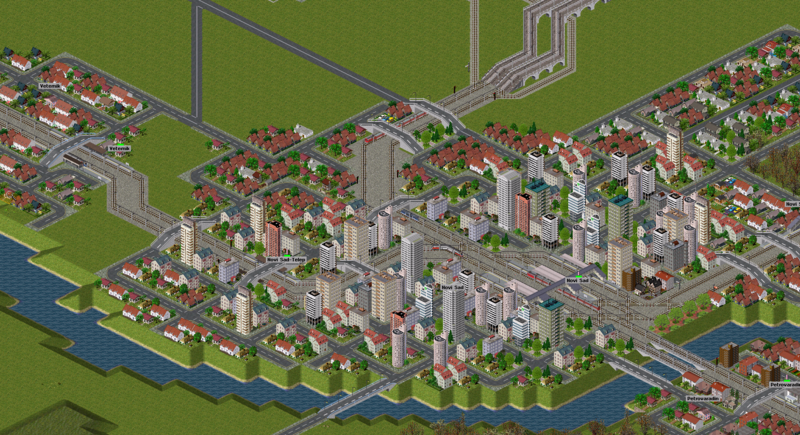 I've also used my own modified versions of pak64's rails and cityroads here. The scale is 400 metres per tile. Note that this is only about a quarter of the actual map, so there's lots and lots left to do! You'll notice that many of the lines in Hungary closely (though not perfectly) mirror those of real life. It seems that in Hungary, lots of population has built up around the rail lines -- so in many cases it would be silly to build them different to how they are. I suspect this situation will be rather different in other parts of the Balkans where real-life rail networks are not quite so extensive. More to come in time! Good luck for the continuation! I'm using the Latin-2 font, so the Hungarian names are mostly copy-and-pasted. Only ő and ű are absent this way. The Slavic languages are more problematic, however, since none of č, š or ž can be copy-and-pasted into Simutrans. The characters are present in Latin-2 but don't appear to be associated with the correct characters. The utf-8 discussion here and here appears to fix this (and also gets you ő and ű). I hope this will become possible with the ordinary Simutrans font face at some stage. Carlbaker, this is wonderful! 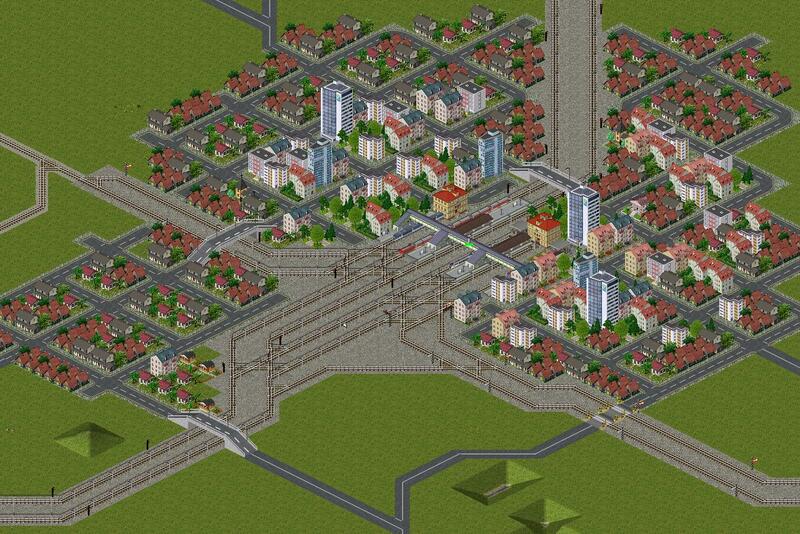 I'm impressed with your clear and simple city and railway design. Waiting for more screens. The lines are roughly colour-coded. Purple lines are international express routes. Yellow and dark green lines are ordinary express trains. Light green lines are inter-regional services. Light blue lines are urban local services (usually electrified), and red and brown lines are other regional services. Edit: this diagram is now out of date, as you'll know if you downloaded the savegame below. I plan to update it when I get the time. I will make some Ikarus(volán) coach buses. This buses runs between Budapest-Érd, and Törökbálint érd. I will send to you if it interest you. Usually I play with pak64german, and buses works in this pakset. This is Szeged, the third largest city in Hungary. As you'd expect, it's a busy rail hub, and has two stations -- the main station, to the west, and the riverside station ("Folyóparti") to the east. Szeged has two hourly services to Budapest -- one an express and one a slower service -- and services to many several Hungarian destinations such as Pécs and Békéscsaba. It also hosts international services: two trains to Serbia (an express to Belgrade via Zrenjanin, and a local to Subotica), and an inter-regional service to Arad in Romania. Customers for Timişoara (a popular destination) should change at Arad! Journey time to Budapest is about 1h45m; to Belgrade it's 2h30m. The train displayed in the northern-most platform at the main station is a Desiro of my own making. The other trains are fictional DMUs used mainly on inter-regional services and some minor mainlines. The rar archive contains the savegame itself, and a standalone folder that contains (a) the version of ST Experimental under which the map runs best, and (b) the pakset required for the map. Simply put "Balkans Savegame.sve" in your /Documents/Simutrans/Save folder, and run the .exe file provided in the archive. While the save will run with any recent version of Experimental, the version provided here includes a couple of my patches that will (hopefully) be in a future stable release -- and the passenger network runs best with those patches enabled. 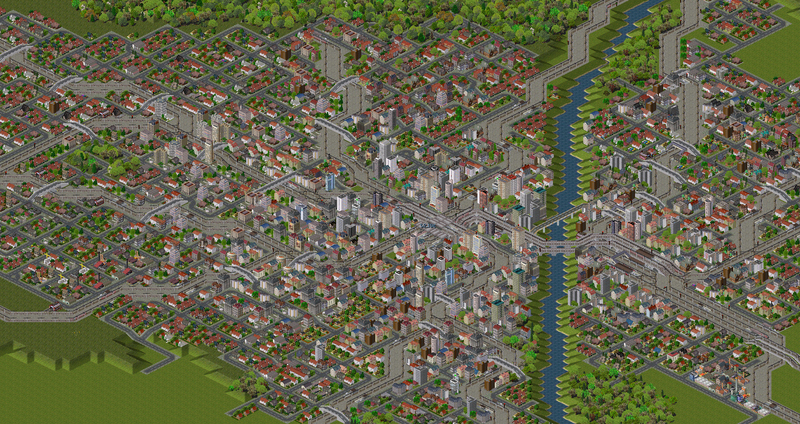 Some info about the map: city populations are 5% their real size; so a city of 100,000 people is scaled down to 5,000. The scale is set to 400 metres per tile, and everything works out more or less accurately. The map is radically incomplete, so I'll update as and when more is completed. This map demonstrates how powerful network planning can be with some of Experimental's features. Convoy spacing, in particular, allows for more realistic use of track -- there are places on this map where several routes use the same tracks, which is sometimes difficult to achieve in Standard. Szolnok is on a busy mainline from Budapest to large cities like Debrecen, Timisoara and Oradea. It's also a hub for several other local and inter-regional routes. Here's an updated savegame. See the post immediately above this for instructions. 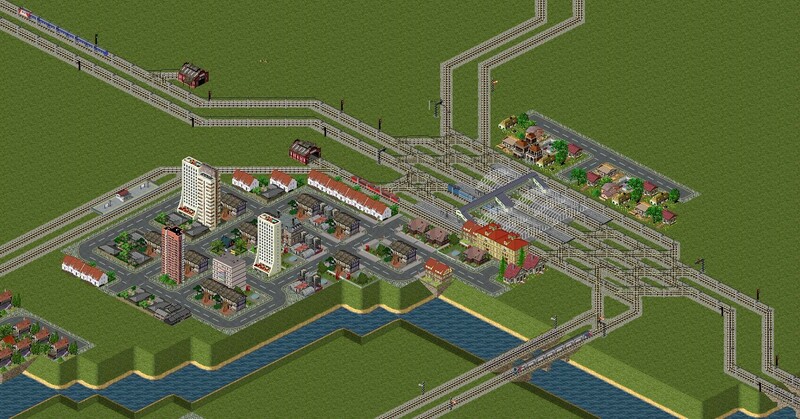 I've expanded into Romania and Bosnia, built more lines in Serbia, and tidied up some of the suburban rail around Budapest. Two new things to share today! First, here's a video from this map: a journey from Budapest to Győr. We follow a semi-fast service that stops at Budaörs, Bicske, Tatabánya and then all stations to Győr. On the way you can see the operations of several suburban lines around Budapest. Look out for slow services interworking with express trains on the same tracks. (Note: the service we follow is underground until Budaörs!) You might also be interested in a related video from real life: an in-cab journey from Gyor to Budapest in 9 minutes. I recommend viewing at one of the higher resolutions or it will be rather blurry. As you can see, operations are beginning to expand into Bosnia, Romania and Bulgaria. Once again, fullscreen/720p quality recommended. Hopefully I'll make more of these soon. Since I last posted here, this map has been started again from scratch. I've been working on it more recently and hope to find the time to make a video introduction to the map soon. I doubt it will be a series (mainly because I imagine far fewer people are interested in this than in the GB map), but one or two videos will hopefully follow. Here are some screenshots for now. The nostalgic among you may remember that this is almost exactly the same area covered by the 'Orient Express' scenario in Railroad Tycoon 3. This map is not like the GB map, in that I am not trying to simluate the real-life rail network of this area, but rather to reimagine it in a world where (a) political boundaries matter less, and (b) these countries have a level of rail investment closer to that of Western European nations. Nevertheless, all services fully timetabled using convoy spacing, in the same way as the GB map -- the difference is the timetables are entirely fictional. The cluster in the middle is Budapest. Vienna and Bratislava are in the north west, while the cluster at the south is Belgrade. The furthest east point so far is Baia Mare in western Romania -- so, as you can see from the Google map, I've really only made inroads into about a third of the map's area so far. The main line from Budapest to Belgrade passes through Subotica, a city of around 140,000 people (IRL). What's more, several local and inter-regional services terminate here, making it a popular transfer station. To the west, trains travel via Sombor to Osijek, just over the Croatian border. To the east, services travel to Arad in Romania via Szeged in Hungary. Finally, an hourly service from Subotica to Timişoara, also in Romania, travels south along the mainline for a short while before branching off via Kikinda. I am currently finishing off the lines in Slovakia, after which I will pay attention to the tiny parts of Austria and Czech Republic in the far northwest of the map. I look forward to how you progress with this map and of course your continued incredible work with the GB map. It those pakset and gamesave loadable in Simutrans Exp 11.4 ? Here is an updated savegame for this map. 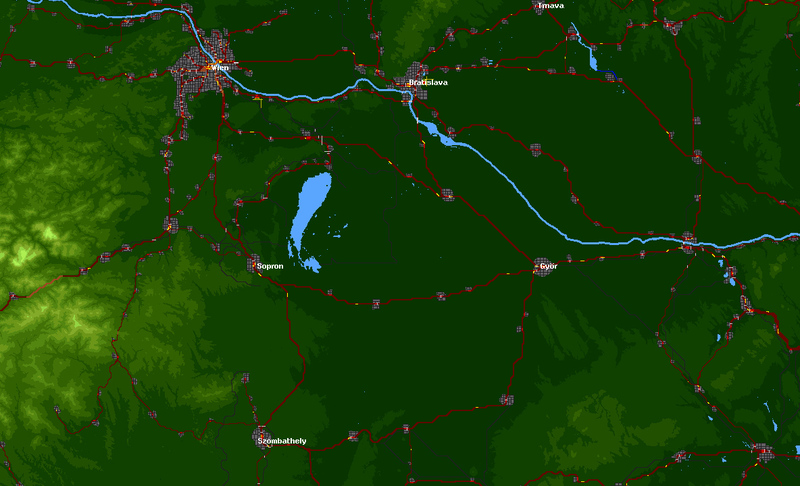 Also, here's an in-depth look at a section of the map that is finished -- around Miskolc, in north-east Hungary. Remember, this map is a recreation of the area imagining what the rail network would look like with (a) increased prosperity and investment and (b) a breakdown of economic and cultural barriers between countries. 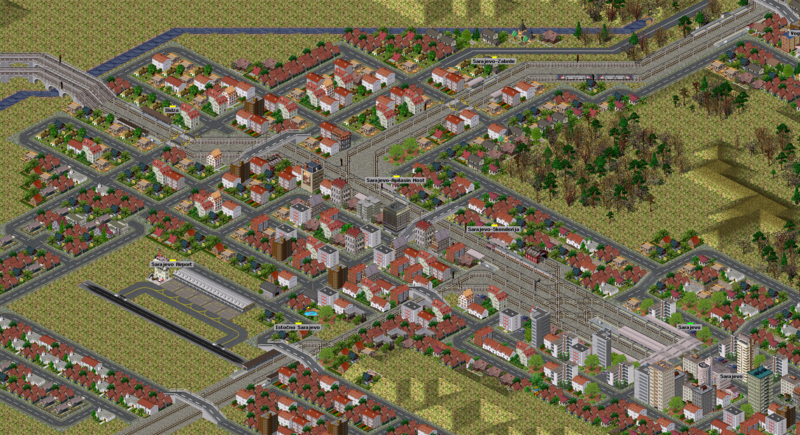 As you can see, Miskolc has four stations in the city itself. Most terminating services end at Corvin utca, the main station. One service from the north terminates at Miskolc-Déli ("south"), and one service from the south terminates at Miskolc-Szentpeterikapu, in order to keep platforms clear the main station. 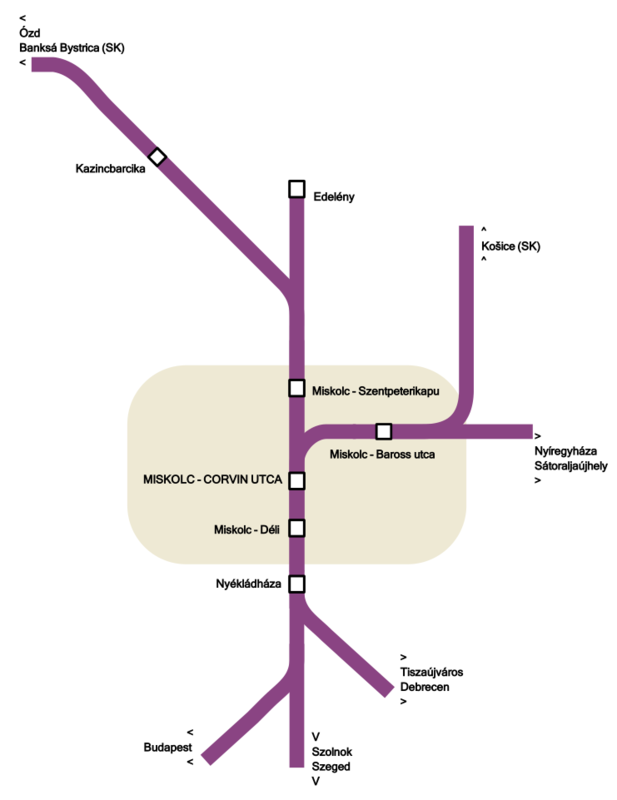 These services also provide extra trains between Déli/Szentpeterikapu and the main station, Corvin utca. Here's a timetable of the services running each hour from Corvin utca - the large station in the middle of the screenshot. Platform 1 is on the left (west) side. Miskolc is on two international lines, both running to Slovakia -- services run to Banska Bystrica (central Slovakia) and Košice (eastern Slovakia). In addition to Budapest, Miskolc has direct services to several other major Hungarian cities: Debrecen, Szeged, and Nyíregyháza. Passengers headed to Romania will change at Debrecen for direct services to Arad and Timișoara or at Nyíregyháza for the line to Baia Mare. Nyíregyháza will also eventually be the place to transfer to services for Uzhhorod and Mukachevo in Ukraine. Passengers headed to Serbia, Croatia and the south end of the map will either go via Budapest, from where regular express trains run to Belgrade and Zagreb, or take a slightly more scenic route via Szeged in south-east Hungary. Brown lines are rail lines and green lines are bus lines. The bus lines are mostly planned, and not yet operational -- apart from two. The grey box shows the limits of the heightmap. I've been using this for planning future routes. Also, here's a resource that I've come to rely on quite extensively for this map: citypopulation.de. It maps the major settlements in a given area and shows their population -- very useful for planning routes and building cities. It´s Your Gamesave and the Pakset that you be post have work with the new 11.22 ? It should do, yes, although I haven't gotten around to testing 11.22 yet. 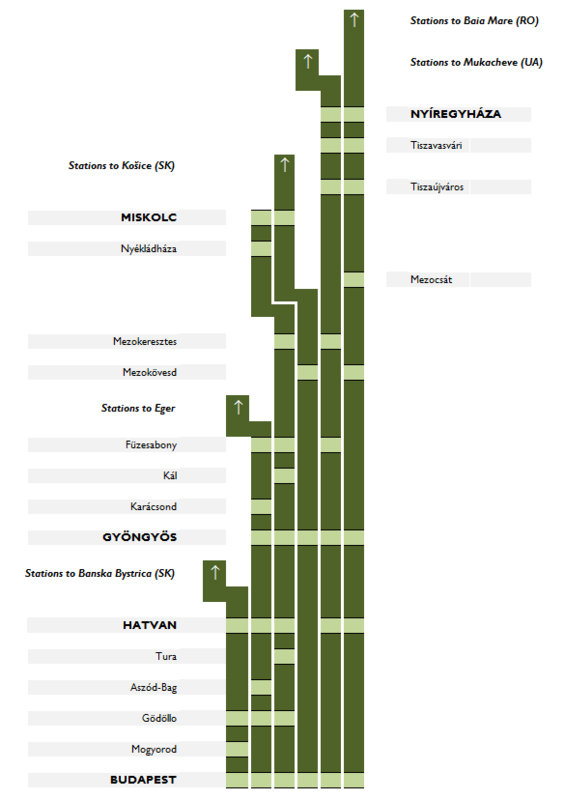 And this image shows the routes that run hourly. There are six services, of which four eventually end up outside of Hungary. This is a double-track route with no passing places, so the variations in stopping patterns - the shorter distance trains have more stops - means that it took some tinkering to make the timetable work so that the fast trains have a smooth run in to Budapest without having to wait for slow trains. This is a double-track route with no passing places, so the variations in stopping patterns - the shorter distance trains have more stops - means that it took some tinkering to make the timetable work so that the fast trains have a smooth run in to Budapest without having to wait for slow trains. Yes, in real life Hungarian stations tend to have quite a lot of platforms - far more relative to the level of service than you'd find in the UK. In fact it's not true to say that I have no passing platforms - some of the main stations have multiple platforms that would allow for overtaking if need be. What I meant to say was that none of those six services do in fact overtake one another. The "travel as straight as it can" problem - I usually get around this by putting the passing loop/platform to the side of the main track. Yes, in real life Hungarian stations tend to have quite a lot of platforms - far more relative to the level of service than you'd find in the UK. In fact it's not true to say that I have no passing platforms - some of the main stations have multiple platforms that would allow for overtaking if need be. The reason for this is the Eastern-bloc history, where goods traffic remained very high, and thus generally passing loops and yards for waiting goods trains remained plentiful, where in the west they were promptly removed starting in the 1930's as transport shifted to the roads. Usually 3 platforms are provided even at the smaller stations (with the exception of halts, of course) to facilitate overtaking should there be a need thereof, as well as an additional number of tracks, which can be quite great, for goods and non-stopping services. On single track lines the common practice was to run several services after each other (goods mostly) and then have them wait to be overtaken by any eventual passenger services at the next station, and thereafter repeat the process (this is why you will see such enormous station goods trackage in the former Soviet Union, with plentiful trackage for held up trains). The usage of these tracks have obviously declined perilously due to the increased preference given to road haulage following upon 1989-1991, but I suppose they are kept sometimes just because it's cheaper than lifting them, though some of them tend to be of terribly declining quality. I figured it must be to do with goods traffic -- that's very interesting to know, thanks! Are you going to upload a new version of the save game? I always found it a nice one. I suppose it depends on how much you have been bothered to add since last (but it was a while ago). Most recent updates have been in western Romania. It's a long time since I've updated on this one. Little progress was made in 2015 but now there's more to show. Meanwhile you can download the savegame and pak folder here. Pictured - Novi Sad in central Serbia. Here the mainline from Belgrade to Budapest branches into the line toward Osijek, Pecs and ultimately Vienna. Having heard that China plans to build a high-speed railway between Budapest and Belgrade (I'll believe it when I see it), I thought I'd better spruce up that mainline on my map. While this map is fictional it tries to be at least relatively realistic, so there aren't any speeds above 100mph (160kph). But with some linespeed improvements and stopping pattern changes, the journey from Budapest to Belgrade is now only 3h10m with a half-hourly frequency. That's hardly stellar for a 210 mile journey over flat terrain, but I doubt that the real-life improvements will achieve much more. Pictured - Sarajevo. The line to the west heads to Mostar and Split. The incomplete line to the south will link with Montenegro and Albania. The line to the north carries services to Belgrade and Budapest. 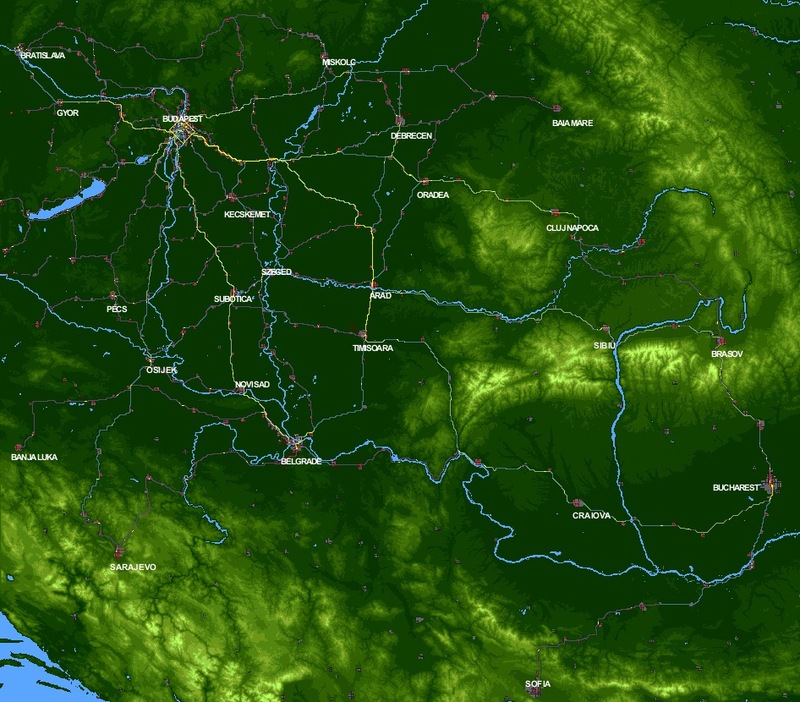 I've built a few more lines in Bosnia, connecting Banja Luka to the network with a regular service to Novi Sad (3 hours), and a domestic route from Sarajevo to Bihać via Banja Luka (a little under 5 hours). More interestingly, I've built a line which exists in real life but has been closed since the 90s - the Una line which links Zagreb to Split via Bihać and Knin. It's the sort of link that would obviously exist if not for political and economic boundaries, and since my map imagines the region without those boundaries, it was a no-brainer. Pictured - Split, on Croatia's Dalmatian coast. Currently only has trains to Zagreb (5 hours), but will soon gain a link to Sarajevo via Mostar (just over 3 hours). Having read about some of the ambitious base tunneling projects happening in the Alps, I decided to get a bit more aggressive about tunnel-building for mainlines in the Balkan mountains rather than making each route wind its way around the valleys. There isn't too much to show for this yet, but the under-construction route from Sarajevo to Nikšić and Podgorica (Montenegro) will feature a 10-mile-long tunnel under a mountain. Pictured - Zagreb, Croatia's capital. The main station has a relief siding for trains to wait in, to free up platforms. There's a quarter-hourly 'crossrail' commuter service running from towns west of the city to the eastern end of the city limits. Mainline services to the east leave for Budapest, Belgrade and Osijek regularly, with other local services in between. More progress to report here! 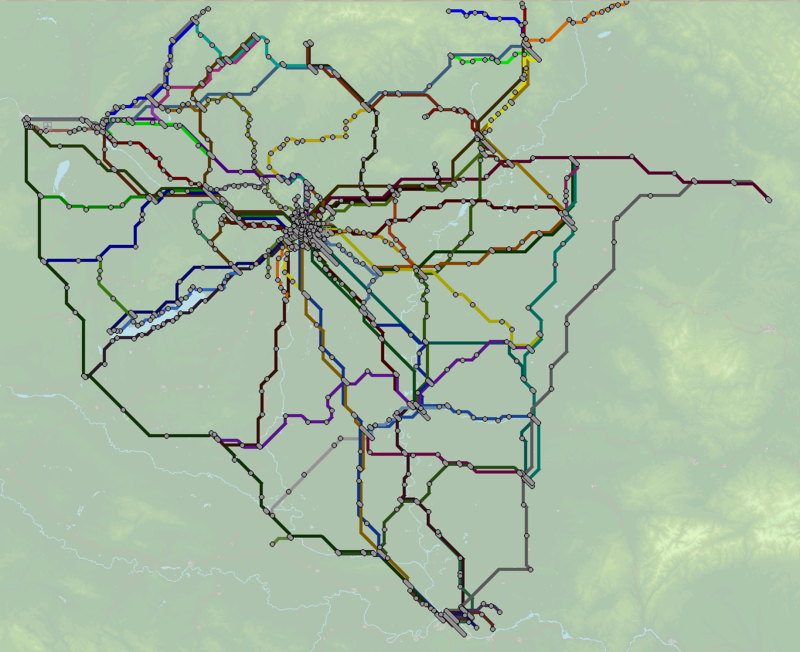 I've rebuilt Vienna, vastly expanded its commuter rail lines, and added a lot of detail to the Austria portion of the map. Click these images for larger versions. Vienna was previously in a forgotten corner of the map. It's obviously not the focus of a 'Balkans and SE Europe' map. But geographically speaking, it doesn't really make sense to have a map which includes Budapest and Bratislava and leaves out Vienna. 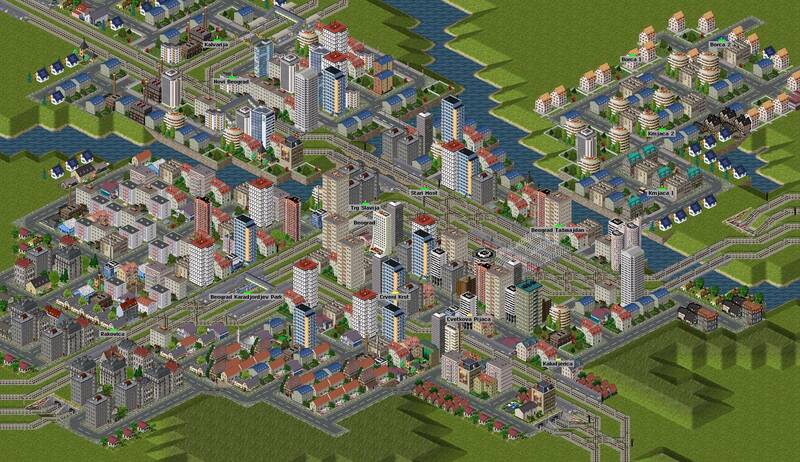 Including Vienna also makes it faithful to the old Railroad Tycoon scenario which inspires this map. Having rushed through the area when I first built it, I've gone back and given it the attention it deserves. Unlike most of the rest of the map, however, Austria is already well-served for rail services - so it doesn't mark much of an improvement on reality. Vienna is well served for long distance routes on this map. It enjoys a twice-hourly service to Budapest via Győr, with a travel time of 2h30m. There is also a regular long-distance service to Belgrade in Serbia, via Sopron and Pécs in Hungary, Osijek in Croatia, and Novi Sad. The whole journey takes 5h40m. Finally the express between Slovakia's two largest cities, Košice and Bratislava, continues a further 35 minutes from Bratislava to Vienna to add connections to the whole of Slovakia. Due to high demand on the Belgrade route I'm thinking of adding another dedicated service to Zagreb in Croatia, branching off from the main line at Nagykanisza and travelling via Varaždin. Speaking of Bratislava, here's an animated gif of services going through the main station. 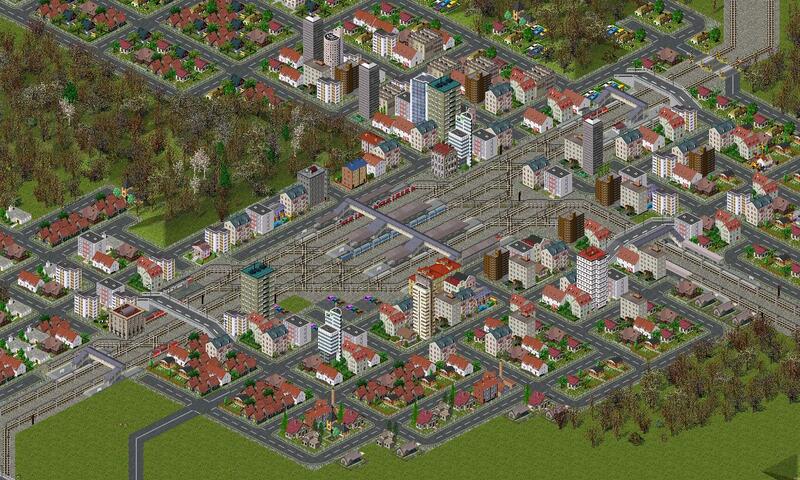 This is now a busy hub with around 17 trains per hour. Three trains per hour head west to Vienna. Two trains per hour head to Budapest via Győr, and another travels to Budapest via Nové Zámky (corresponding with the real-life route). Aside from other trains within Slovakia, there is also an inter-regional train to Břeclav - the tiny portion of Czech Republic which makes it on to this map. Carl, may I just say that the download link is dead. If you could get it back up again it would be great. Thanks. Thanks. 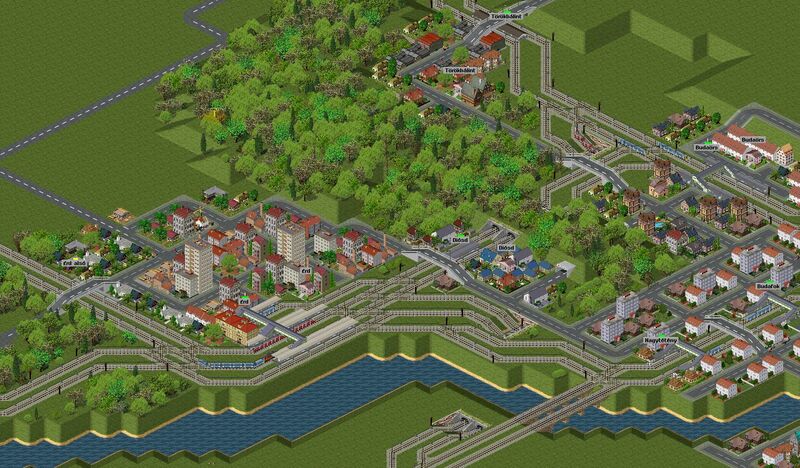 I am looking around and it is one of the best maps in Simutrans!